Lexmark’s new C762dn colour laser, with networking, duplex printing and high-yield toner cartridges, offers outstanding quality and ease of use plus intelligent ways to control costs! 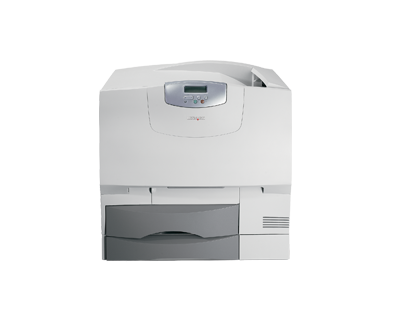 The Lexmark C762dn delivers speeds of 23 pages per minute A4 in color and monochrome for complex print jobs. The 600 MHz processor helps generate the first color page in less than 15 seconds and 13 seconds for black. Our high-speed technology will eliminate bottlenecks and waiting for print jobs at the printer. This fast delivery enables your workgroup to be more efficient which saves you money. The Lexmark C762dn printer with 4800 Color Quality mode (the default setting) produces high print quality while using less memory for faster processing. Sharp business graphics and professional looking documents can now be delivered fast when you’re in a hurry. To resolve fine details in your photos and graphics, select the true 1200 x 1200 dpi resolution setting.